A previously unseen photograph of Florence Nightingale is going on display to mark the 150th anniversary of her return from the Crimean War. Taken by amateur photographer William Slater, the picture shows the "lady of the lamp" sitting reading outside her family home in Embley Park, Hampshire. The newly discovered photograph will go on display until 7 November at the Florence Nightingale Museum in London. She gained worldwide renown for her work as a nurse during the Crimean War. The photograph came to light after an article in a local paper about the discovery of three albums of photographs. Mark Bostridge, author of a forthcoming Nightingale biography, said: "This is an immensely exciting discovery. 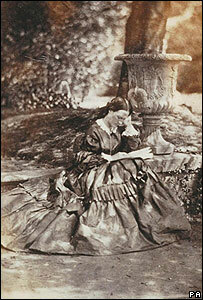 Photographs of Florence Nightingale are very rare. "She was extremely reluctant to be photographed, being determined 'in no way to forward the making of a show of herself', partly for religious reasons and also because she regarded any personal publicity as detrimental to the causes of public health for which she worked so tirelessly after her return from the Crimean War." The picture was taken in May 1858, two years after her return from the Crimea. She emerged a heroine from the conflict in which she led a team of 38 female nurses ministering to wounded soldiers in horrific conditions. Alex Attewell, director Florence Nightingale Museum, said: "This is a very significant find. "The photograph will help us to illustrate a period of her life often overlooked in favour of the 'lady of the lamp' legend, when she devoted herself to thirty years of work away from the public eye, transforming the profession of nursing, reforming Army healthcare and improving hygiene standards in hospitals. "The whole album is also significant as an example of early photography. We are extremely grateful to the previous owner for donating the album to us."